Interplanetary dust particles carry water generated with hydrogen solar wind. Credit: John Bradley. New research shows that interplanetary dust particles from comets, asteroids, and leftover debris from the birth of the solar system, could have helped jump-start life on Earth and other terrestrial planets. 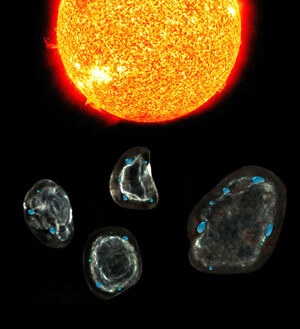 Researchers from the University of Hawaiʻi at Mānoa’s School of Ocean and Earth Science and Technology (SOEST), Lawrence Livermore National Laboratory, Lawrence Berkeley National Laboratory, and University of California – Berkeley discovered that interplanetary dust particles (IDPs) could deliver water and organics to the Earth and other terrestrial planets. Interplanetary dust, dust that has come from comets, asteroids, and leftover debris from the birth of the solar system, continually rains down on the Earth and other Solar System bodies. These particles are bombarded by solar wind, predominately hydrogen ions. This ion bombardment knocks the atoms out of order in the silicate mineral crystal and leaves behind oxygen that is more available to react with hydrogen, for example, to create water molecules. “It is a thrilling possibility that this influx of dust has acted as a continuous rainfall of little reaction vessels containing both the water and organics needed for the eventual origin of life on Earth and possibly Mars,” said Hope Ishii, new Associate Researcher in the Hawaiʻi Institute of Geophysics and Planetology (HIGP) at UH Mānoa’s SOEST and co-author of the study. This mechanism of delivering both water and organics simultaneously would also work for exoplanets, worlds that orbit other stars. These raw ingredients of dust and hydrogen ions from their parent star would allow the process to happen in almost any planetary system. Implications of this work are potentially huge: Airless bodies in space such as asteroids and the Moon, with ubiquitous silicate minerals, are constantly being exposed to solar wind irradiation that can generate water. In fact, this mechanism of water formation would help explain remotely sensed data of the Moon, which discovered OH and preliminary water, and possibly explains the source of water ice in permanently shadowed regions of the Moon. It has been known since the Apollo-era, when astronauts brought back rocks and soil from the Moon, that solar wind causes the chemical makeup of the dust’s surface layer to change. Hence, the idea that solar wind irradiation might produce water-species has been around since then, but whether it actually does produce water has been debated. The reasons for the uncertainty are that the amount of water produced is small and it is localized in very thin rims on the surfaces of silicate minerals so that older analytical techniques were unable to confirm the presence of water. Using a state-of-the-art transmission electron microscope, the scientists have now actually detected water produced by solar-wind irradiation in the space-weathered rims on silicate minerals in interplanetary dust particles. Futher, on the bases of laboratory-irradiated minerals that have similar amorphous rims, they were able to conclude that the water forms from the interaction of solar wind hydrogen ions (H+) with oxygen in the silicate mineral grains. This recent work does not suggest how much water may have been delivered to Earth in this manner from IDPs. In future work, the scientists will attempt to estimate water abundances delivered to Earth by IDPs. Further, they will explore in more detail what other organic (carbon-based) and inorganic species are present in the water in the vesicles in interplanetary dust rims. Be the first to comment on "Interplanetary Dust Particles Can Deliver Water and Organics to Terrestrial Planets"